With over 20 years’ experience as a greenkeeper, Scott has a thorough understanding of the professional turf industry. He started his career working on a polo property in country NSW before moving onto some welll-known Australian golf clubs such as the Royal Adelaide Golf Club and Gold Creek Country Club. Most recently, Scott held the position of superintendent at Queanbeyan Golf Club, where he successfully completed major renovations of the couch fairways. Scott is well known in the ACT and South Coast turf industry where he has an impressive golf reputation and a handicap of plus three. Scott currently holds the position of captain of the ACT golf team, having previously won the 2012 AGCSA Championship and then gone onto compete and consequently come runner up in the GCSAA National Championship held at Torry Pines Golf Club in San Diego, USA. 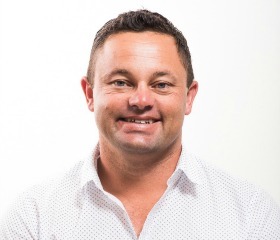 With a strong reputation and a passion for the turf industry, Scott is the ideal candidate to service Living Turf’s clients in the ACT, NSW South Coast and Riverina area, where he grew up.